Horses in transition get new careers as therapists. Bud Kamrud has been challenged by muscular dystrophy (MS) all of his adult life. But once a week he is free of the disease’s limitations thanks to a therapy horse named Claude and the staff at the Colorado State University (CSU) Equine Assisted Activities and Therapies (EAAT) Program. 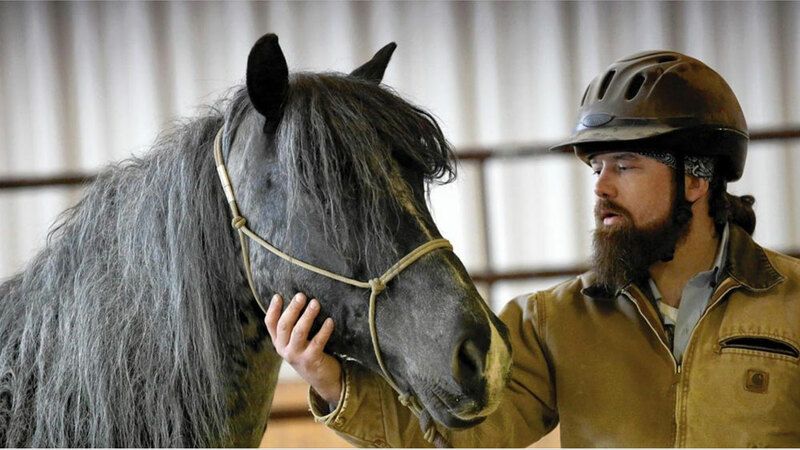 Kamrud, who has been riding once a week for the better part of 20 years, is among the more than 50,000 men, women and children who, according to Professional Association of Therapeutic Horsemanship International (PATH), participate in equine-assisted therapy programs across the U.S. This therapy helps them cope with a range of physical and mental challenges, including MS, autism, post-traumatic stress disorder (PTSD) and Alzheimer’s disease. 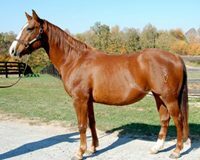 Horses used in those programs represent a variety of breeds, but nearly all are what are considered “horses in transition,” donated by owners whose animals have moved on after having successful initial careers. Other horses move on to EAAT programs from the Dumb Friends League Harmony Equine Center in Franktown, Colo. The center takes in horses seized, removed or surrendered in law enforcement cases, and currently supplies all the animals for the Temple Grandin Equine Center at CSU, according to Harmony’s Director Garret Leonard. Once Harmony horses arrive at the Temple Grandin Center, they’re paired with students pursuing degrees in equine science, according to Adam Daurio, Esq., the Center’s director of administration and outreach. The students spend four or five months preparing the animals to participate in EAAT programs, including the one at CSU. While most of the horses arrive at the Center already trained to halter, lead, load and ride, their student handlers assess how well the animals tolerate routine grooming and tying. At the same time, they desensitize the horses to a variety of sights and sounds they may encounter on the farm. “We generally know within two sessions if the horse is appropriate for an EAAT program,” Daurio says. Those that do make the grade participate in a variety of EAAT programs, including therapeutic classes in which people learn to ride, generally at the walk and trot levels, says Sharon Butler, DVM, a certified therapeutic riding instructor at the CSU Equine Science Department. As part of these classes, horses are exposed to various toys and games, riding patterns, and trail riding around the CSU Equine Center. Meanwhile, therapy horses may also take part in hippotherapy sessions as part of another program where physical and occupational therapists encourage their clients to improve their physical and cognitive functions by riding. And while therapy horses may be of any breed or discipline, they all must have a unique skill set, says certified hippotherapist Brent Applegate, HPCS. Applegate is the owner of My Heroes, LLC, which has programs at CSU, the National Western Stock Show in Denver, and the Chastain Horse Park in Atlanta. But not all therapy horses have had human-centered careers. Some, like the Bureau of Land Management (BLM) Mustangs used by the BraveHearts Equine Assisted Therapy Programs in Illinois, have traded the range for a more domestic life. 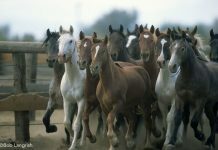 In 1978, wild horses residing on ranges in the western U.S. were federally protected and placed in the care of the BLM. That agency conducts gathers aimed at maintaining the sizes of wild herds and puts some of those gathered horses in its adoption program. BraveHearts has adopted its team of Mustangs from the BLM. Veterans gentle the formerly wild horses as well as doing ground activities, driving and riding. Army veteran Mitchell Reno believes the horses changed his life. Reno served two tours of duty in Afghanistan when he landed in a veteran’s hospital in Chicago with a broken back, a broken neck and addictions to alcohol and prescription drugs. After a fellow veteran encouraged him to visit BraveHeats’ facility, Reno joined the program, doing everything from cleaning stalls to gentling Mustangs. Two years later, Reno credits the Mustangs with helping him find his way though PTSD-related depression and anxiety, as well as the long-term effects of his physical injuries. Likewise, Bud Kamrud believes that the horses at CSU are enhancing his quality of life in a way no human therapist could. According to Kamrud, the EAAT program at CSU helps him not only get the physical exercise he needs, but encourages him to socialize with other EAAT clients and equine science students too. 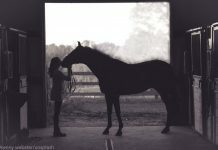 He believes the connection with horses and humans is transformational. “I suppose that a physical therapist might be able to give me exercises to do to help me, but I probably wouldn’t keep up with them. As it is, there have been days when I’ve said, ‘Maybe I don’t want to go through all this to get on the horse,” says Kamrud, who uses a special ramp and lift to mount the horse.